Are you a ride leader and need to renew your First Aid? Do you like rolling around in the mud? Do you want to learn a valuable skill? Do you like having fun with like minded people? 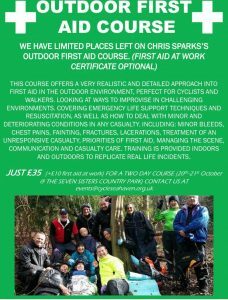 We have another Outdoor First Aid course on 20th and 21st October. Participants MUST be able to attend both days and the days are long but FILLED with fun. Chris Sparks is an amazing trainer that makes this very interesting, informative and fun. 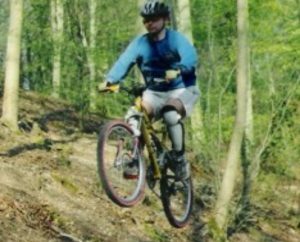 Friston Forest MTB continues every Friday for 2019. Meet at 7 pm at The Gate, just round the corner along Litlington Road. Helmets, good lights and knobbly tyres essential. Knee & elbow pads optional, first aid kits available. Be prepared for single track, craters, jumps, berms and Cardiac. Have fun! A great opportunity to develop your (wild side) full potential. This Autumn join a FREE guided Discovery Ride and discover the Downs on your doorstep! Rides are suitable for all levels of rider and are designed to get more people out exploring and enjoying the South Downs by bike. 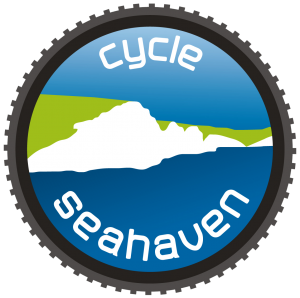 Rides start from Winchester, Shoreham, Peacehaven and Eastbourne and each route will give you an insight in to the South Downs National Park. Using leafy country lanes, bridleways and traffic free trails and connecting you to the Downland landscape and highlighting the special qualities, it’s wildlife and hidden histories. Capture the special qualities of the Downs landscape through a lens or camera-phone with local photographer Carlotta Luke. Explore the farm and meet the farmer and animals at Telscombe Stud Farm. Discover the unique history of Telscombe and Southease churches with local historian Ian Everest and enjoy a picnic by the River Ouse (bring a picnic). Explore the nature on your doorstep with a gentle ride along the Ouse Valley. A relaxed and fun way to gain or improve cycle skills with like-minded individuals, finishing with a short bike ride. Free Shop Ride with Mr Cycles: Sat 15th Aug, 9.30am start. How to ride your road bike in a group safely. 2hrs with qualified instructor (Jamie Lynch). Booking essential, contact the shop on 01323 893130. If you’re new to riding on the road, riding in groups, or perhaps thinking of doing a sportive for the first time, this is for you. Learn how to ride safely in a group and communicate effectively with your fellow riders. The 2C ride only had two people on the night so despite the fact that it would be more demanding for Paul and I and it would slow down the 3C a little, we decided to integrate the two rides into one for safety reasons. Knowing to be a lot slower than the 3c going uphill, we did went with an head start hopping to make it up cardiac at the same time as the 3c riders. We set up a good pace and went straight from the gates to the top of cardiac in one straight run reaching the top about 5mn before the first 3c riders. After a pause to recuperate we went all down to the 3rd craters were we decided to rejoin cardiac half way up while the 3c went down to the candy canes and up again. Once at the top of cardiac it was down via stumpy higher trails , very muddy as usual then one of my favourite trail Doris and Burt then up a step as hell muddy track to a set off on new trails to me. I was surprised how most of the trails had dried up ! Of course any trails holes were still very muddy, but in all the forest was drying very nicely. This was a result as after the ride, we did not have the usual major bike cleaning session and for me it was just a matter of brushing off a little mud of the bike and tyres Fantastic. The 2C was out for 2 hours did 9 mls in 1.24 pedalling time, not bad going. This Friday we are hoping to be back to our 2C ride level as long as we have our safety minimum of 3 riders. Weather so far is looking good for Friday so I hope the numbers will be up!